Detailed guide with helpful information on Wisconsin fees, requirements, licenses, and formation. Includes resources, FAQs, and downloadable checklist. Wisconsin's growing economy has made the state a great location to start a new business. Entrepreneurs have access to a range of industries including construction, real estate, forestry, and agriculture. In 2017, small businesses made up 99.4% of Wisconsin businesses, employing 1.2 million people. Each business structure has different benefits. Your business structure should offer you the best liability protection, tax benefits, and financial advantages for you and your business. Many small business owners prefer the LLC structure because of its flexibility and minimal paperwork. In addition, an LLC is beneficial during tax season, as owners are not obligated to file a corporate tax return. You can set up an LLC in the state of Wisconsin by filing an Articles of Organization form with the Wisconsin Department of Financial Institutions. There is a fee of $130.00 for filing online and $170.00 for filing by mail. 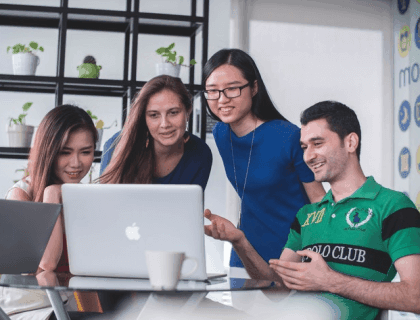 There are also specific versions of some of these legal structures available including limited partnerships, general partnerships, C corporations, and S corporations. Your business plan is an important step in your planning. It helps set priorities, plan strategies, develop accountability, and manage goals. A business plan is key when searching for investors, bankers, or business partners. A detailed and well-researched business plan makes it easier to communicate planning objectives and strategies. 3. Register a business name. Under Wisconsin law, you must register your business name with the Wisconsin Department of Financial Institutions (DFI). 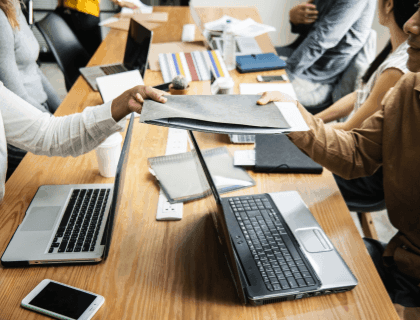 For LLCs and corporations, you will need to verify that your business name is different from the names of other businesses already registered with the DFI. You can check if your name is available by searching the business name database. If your business name is available, you can file a Name Reservation Application with the DFI and reserve it for 120 days. For sole proprietorships or partnerships, if your business name doesn't include the owner/s name or surname, you can file a Registration of Firm Names with the Register of Deeds in the county where your business is situated. 4. Get an Employer Identification Number. All Wisconsin employers must obtain a federal Employer Identification Number (EIN) from the IRS. You can complete an online application on the IRS website. There is no required filing fee. In addition, it's important to note that an EIN is needed if your business is taxed separately from you. Many banks also require an EIN to open a business account. Banks offer a range of business accounts with various features. Contact your local banks and learn more about their fees and account benefits. 6. Register with the Wisconsin Department of Revenue. If your business is selling goods, you need to register for sales tax with the Department of Revenue (DOR). In addition, if you plan on hiring employees, you will also need to register for employer withholding taxes with the DOR. You can register for both taxes using the state’s One Stop Business Portal or the DOR’s online registration site. Federal and state law require that Wisconsin employers report all new and re-hired employees to the Wisconsin New Hire Reporting Center. Whether your employees are full-time, part-time, or temporary, you need to report them within 20 days. If an employee has been separated from your business for 60 consecutive days, you need to report them as a new employee. For quick and easy reporting, use the online option. You can also download, print, and fax or mail the New Hire Reporting Form. Mailing information is available on the form. This process has to be repeated with every new employee. 8. Obtain applicable state licenses and permits. To legally operate your business, you may need licenses and permits. For example, if you plan on selling liquor at your business, you need a liquor license. To learn about or apply for tax-related licenses, you can contact the Wisconsin Department of Revenue. However, other regulatory licenses and permits are managed through the Department of Natural Resources and the Department of Health Services. For information about Wisconsin licenses and permits, check the websites for any cities or counties where your business will be located. Businesses that offer professional and occupational services are required to obtain special licenses and permits from various departments. To find out about the different state licenses and permits for professional services, visit the Wisconsin Department of Safety and Professional Services (DSPS). On the DSPS website, you'll find different sections with information including Business Professions, Health Professions, and Trades Professions. Wisconsin employers who hire one or more employees are required to carry workers' compensation insurance. Under Wisconsin law, this applies to all employees. For more detailed information about exemptions, visit the Department of Workforce Development. Minimum automobile insurance is mandatory for all of your business drivers. In addition, if your business uses your truck or car, a commercial vehicle policy is recommended. Who is not considered an employee under the Workers' Compensation Act? Any individual whose employment is not in the trade, business, profession or occupation of the employer. Sole proprietors, partners, and members of an LLC. Volunteers of non-profit organizations receiving not more than $10.00 per week. 10. Keep up with on-going requirements. It's vital that you keep up to date with the latest developments in state laws and regulations. Over time, the requirements of permits and licenses can change, potentially affecting your business and industry. In Wisconsin, LLCs and corporations are required to file an annual report with the Wisconsin DFI. An LLCs annual report is due at the end of the calendar quarter of the anniversary month of your LLC's formation. Corporations are also required to file an annual report by the end of the filing anniversary quarter. There is a $25.00 filing fee. How much does it cost to register a business name in Wisconsin? It costs $130.00–$170.00 to register a business with the Wisconsin Secretary of State. Where can I apply for a Wisconsin sales tax license? You can register for sales tax using the state’s One Stop Business Portal or via the Department of Revenue’s online registration site. Are there any specific rules for an LLC in Wisconsin? In order to register your LLC, you must file the Articles of Organization with the State of Wisconsin. You can file online, by mail, or in person. The filing costs $130.00 - $170.00. In Wisconsin an operating agreement is not mandatory. 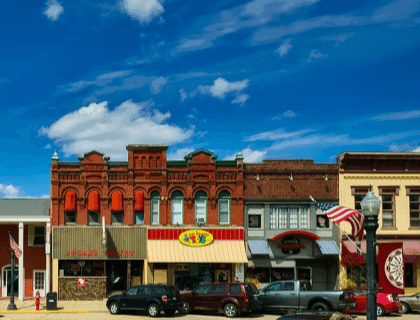 How many small business owners are there in Wisconsin? 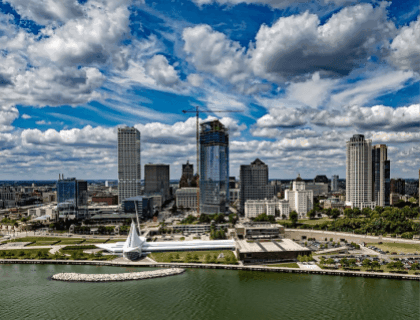 There are 445,445 small businesses in Wisconsin, according to the small business administration. Yes. Wisconsin law requires all employers of one or more employees to carry workers' compensation. 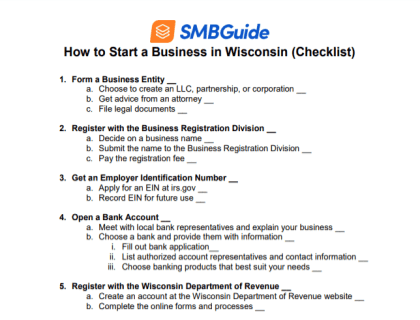 How do I register a business name in Wisconsin? You can register your business name with the Wisconsin Secretary of State. You can visit the SOS website for the proper documentation.